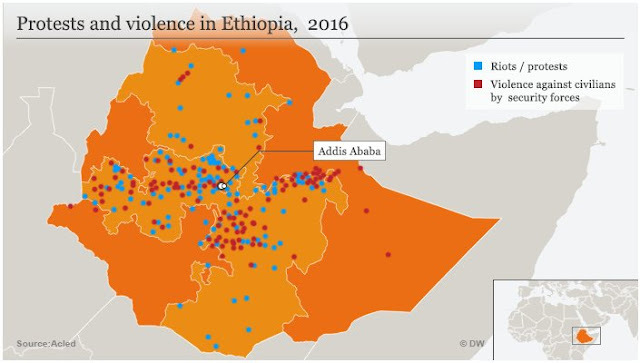 The U.S. Department of State warns U.S. citizens to defer all non-essential travel to Ethiopia due to ongoing unrest that has led to hundreds of deaths, thousands of arrests, as well as injuries and extensive property damage, especially in Amhara and Oromia States. The U.S. Embassy’s ability to provide consular services in many parts of the country is limited by the current security situation. The Government of Ethiopia declared a State of Emergency effective October 8, 2016. An October 15 decree states that individuals may be arrested without a court order for activities they may otherwise consider routine, such as communication, consumption of media, attending gatherings, engaging with certain foreign governments or organizations, and violating curfews. The decree prohibits U.S. and other foreign diplomats from traveling farther than 40 kilometers outside of Addis Ababa without prior approval from the Government of Ethiopia, which severely affects the U.S. Embassy’s ability to assist U.S. citizens. The full text of the decree implementing the State of Emergency is available on the U.S. Embassy’s website.